On Monday January 18th The Today Show spent time covering a topic of importance to Internet users everywhere — optimizing the speed of your home Internet connection. In fact, Bandwidth Place was mentioned by reporter Jeff Rossen as a tool of choice for determining your Internet speed before taking steps to improve performance. He offered some helpful tips sure to be worth noting for anyone trying to stream videos or play online games at home. Let’s take a closer look at what Jeff had to say. 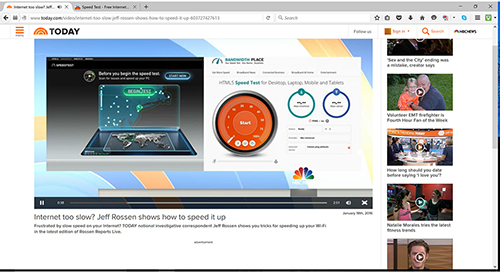 If you notice any issues with Internet performance, like buffering or poor screen resolution when streaming videos, Rossen suggests checking your Internet speed multiple times to get an average reading. Compare this value against what’s promised by your ISP on your bill or your online account, and raise an issue if you aren’t getting the speed you deserve. In the interim, Rossen made a few suggestions to improve network performance in your home. First, move your router away from the modem. The cables used for connecting the modem and router give a small amount of interference, especially any power cables. Rossen suggests placing the router on a bookshelf or even mounting it to a wall to improve signal strength. Investing in a high-end dual band router also offers significant advantages compared to the standard wireless model provided by most ISPs. Additionally, make it a point to check your cables to ensure they aren’t twisted, as that can hamper connection strength. Finally, consider rebooting your router and modem if you are still encountering issues. Rossen described a situation at his home where his router is on a different floor than his bedroom. This prevents him from streaming Netflix in bed. He suggested buying a range extender to boost the wireless signal from the router, improving the signal strength in any dead spots in a home or apartment. Another newer technology worth considering is the mesh network router, which serves a similar function with enhanced performance and security. As a last resort, Rossen suggests calling your ISP and signing up for a faster Internet tier. Consider bundling your Internet service with Digital Phone and TV if possible to garner additional savings. As always, make sure to return to Bandwidth Place regularly to verify your Internet speed. Its HTML5 technology ensures you get accurate results without having to deal with obsolete Flash technology or app downloads.